Big-name brands are dying and even Winnebago is under the weather. Can the recreational vehicle survive the recession? Several decades ago, when my grandparents retired, they hit the road. They circled the United States in a ginormous beige RV, always tending toward warmer climes, staying away from their home in Denver for months at a time. My grandmother would visit libraries and long-lost relatives to do genealogical research, trying (and failing) to find something exceptional in being a woman named Smith from Kentucky, while my grandfather adjusted the rabbit ears on a tiny TV to pick up the nearest broadcast of "Gilligan's Island." There was a lot going on in that show, he told me, that wasn't always apparent the first few times you watched an episode. What Grandma and Pop Pop really enjoyed about the RV, I think, was the companionship. There was a circuit, and they would meet up with their newfound RV friends in places like Arizona and unfold the folding chairs and talk. They even once joined a multi-land-yacht armada that sailed down the Pan-American Highway to Panama. But if they were still alive and chatting with their RV friends around a campfire somewhere, their conversation would probably be taking a mournful turn. The RV industry is in dire trouble, and the whole RV subculture can feel it. 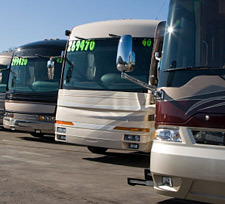 Earlier this month, a survey conducted by the RVtravel.com newsletter determined that two-thirds of the 1,500 motor-home owners who responded think that fewer than half of America's RV manufacturers will still be in business come January 2010. Why so pessimistic? Perhaps because 18 percent of respondents to a February survey said that the makers of their own RV models had already gone out of business. In the past two years, at least a half-dozen RV manufacturers have ceased to be. In March alone, three different big-name RV brands went Chapter 11 -- Fleetwood, Monaco and Country Coach. And on Thursday, the industry leader, Winnebago, announced an operating loss of $35 million for the first six months of fiscal 2009. The RV lifestyle goes on, but the RV business, starved by $4-a-gallon gas last year, is now reeling from the recession and a serious credit drought. An industry that has always been characterized by peaks and valleys, ultrasensitive to economic change, has entered the Valley of Death. Though there were down cycles in the industry, notably in 1979 and 1980 and 1989 to 1991, by the late 1990s there were as many as 9 million RVs from a myriad of manufacturers on the road. The RV had tapped into the seemingly contradictory American desire for comfort and freedom, and the accompanying American expectation that the gas needed to buy that mobility would always flow like water. The most current estimate for the number of RVs on the road is more than 8 million, camping at any of 16,000 RV parks, or simply squatting in the parking lots of friendly Wal-Marts. Nowadays the typical RV includes such amenities as Wi-Fi, refrigerator, shower and microwave, and may even have a push-button slide-out feature that allows the living room to expand to 8 feet in width when the vehicle is parked. The typical RV owner moves up in category from something simple like a tow-behind pop-up trailer to the fully enclosed mobile palace with all mod cons. The demographics of the typical RV owner, however, are a little fuzzier. Some hard facts are available. We know how old they are and how much money they make. The average age of an owner is around 49, and the average income is variously estimated to be $56,000 and $68,000. Ownership also seems to be concentrated in that income range, and to fall off above and below it. But who are these individuals? They tend to be empty nesters or retirees; about 60 percent of the owners of the more expensive, full-amenity motor homes are retired. So-called full-timers live on the road because they can, tethered to neither offspring nor occupation. My grandparents fell within the fat part of the bell curve of the gray-haired, middle-class, wanderlusting RV owner. My grandfather had worked his way up through Mountain Bell to a vice-president's position. My grandmother worked at the local art museum. They were adventurous types, having sailed the ocean in a freighter, visiting Angola "before it went socialist," seeing the world when time and income permitted. Then, in their 70s, in their motor home, they went and saw America. They may, however, have been a tad more affluent than the average RV snowbird. I wonder if the motor home didn't also once represent an attainable dream for people of more modest means. Given the annual income figures, it would seem as if the RV population contains a lot of hobbyists and a lot of retirees who have little margin for fiscal error, who are uniquely sensitive to a wobbly economy, or combustible 401Ks and downsized pensions, or expensive gas. For whatever reason, the RV industry began to decline before the weakness of the larger economy became obvious. RV sales increased every year this decade until 2006. After the peak year of 2006, however, when nearly 400,000 RVs were manufactured and shipped, the market began to tremble. Shipments of new units slipped slightly in 2007. And then the market collapsed. Shipments dropped 33 percent from 2007 to 2008, the year gas hit record prices. Projections for 2009 estimate that shipments will plunge another 45 percent, all the way down to 130,100 units. That would mean a return to the sales levels of 1980. Now, two years into the industry's downturn, the long trail is already littered with RV dead: Rest in peace, Trail Wagons, Sunline Coach, National RV, Alfa Leisure, Ameri-Camp, Travel Supreme, Teton Homes, Weekend Warrior, Western RV, West Coast Leisure Homes. The industry's immediate problems are tied to the recession. The weak economy makes would-be RV owners skittish about buying. But RVs have also experienced a uniquely painful credit crunch, which makes loans hard to come by for those dreamers still willing to make the leap. Lenders are balking at doling out cash for a six-figure discretionary purchase. RVs are not cheap. Winnebago's 11-model 2009 line includes five models with base prices over $100,000; the 39-foot Vectra starts at $302,000. Analysts say the RV credit crunch may not ease for another 12 to 18 months. Meanwhile, the industry is suffering permanent damage; even those companies that remain are mass-producing pink slips. The industry has already shed 280,000 jobs, more than half its workforce, since mid-2007. In Elkhart, Ind., where more than 60 percent of all RV units are built, and one out of every four jobs is RV-related, unemployment is 18.3 percent. RV manufacturers have placed some hopes in the economic stimulus package, which includes credit-easing provisions and tax breaks intended to goose RV sales. Longer-term, they have faith in the sheer statistical weight of baby boomers; the oldest post-World War II babies will turn 65 in 2010, and après them the deluge. But in the short term, some shoppers are scared to buy RVs simply because they don't know if the manufacturers will be around to honor service and parts warranties. And in the future, there is no reason to believe gas will stay as cheap as it is today, unless the economy is so bad that demand stays low. Either fork in the road promises hardship for the RV industry. RV blogger Jim Twamley, who predicted the recent deaths of Monaco, Fleetwood and Country Coach, has serious doubts that any RV manufacturers will last much longer. "I'm not sure anyone is going to survive," Twamley told Salon. "Thor Industries has a good balance sheet. Forest River might survive, because they are backed by Warren Buffet. And I guess Winnebago. If anyone survives, it will be those three. But I won't be surprised if no one does." What would get the motor home off life support? The answer may lie in doing what Detroit did not do until too late in the game. Downsize. Deep-six the land yachts. Build lighter, smaller vehicles that do not cost so much to buy or to maintain. Mark Polk, an RV expert who owns RV Education 101, a company that produces DIY RV books and videos, told Salon the industry is already thinking smaller. "The manufacturers," said Polk, "will be trying to trim some of the cost off, and trying to get their vehicles into a range where the $40,000 a year earner will be comfortable with an RV payment." Twamley says the new products will also be more environmentally friendly, incorporating some of the lightweight, composite materials used to build aircraft, and relying more on solar energy. "I think they [the new products] will be leaner and greener. The carbon footprint will be smaller." And even the pessimistic Twamley thinks the RV concept, if not any particular RV manufacturer, is eternal. "Americans love to RV. It is an American institution. It is firmly established and I am positive it will continue. It's just that the industry will have to create new products to meet the new market demands."